Remember the Palin shoe auction on eBay? As part of the purchase agreement, the governor is supposed to autograph the shoes for the winning bidder, whose identity was not revealed on the eBay site. Now, let’s see if the RNC will get around to auctioning those clothes that The New Majority claims are sitting in trash bags. The Republican party needs the fundraiser! Hat tip Sissy Willis, who’s pounding the shoe beat! David sent a link to this tempest in a teapot from those who have much to gain from class struggle. The woman needs to look picture-perfect every moment of the day, which requires someone to do her hair and makeup, and a dresser. If she can look that good on only $150,000 by all means she has my blessing. Time for a Palin shoe post! So much for early-morning mental acuity. The NYT heading was foreshadowed by a Sportswriter Overcome by Palin Derangement Syndrome. Sister Toldjah has more on the hockey game. John Hinderaker has a great hockey story. Opinion about Palin’s merits is sharply divided, even among conservatives. I acknowledge that she has performed poorly in some recent interviews. Nonetheless, I place myself firmly in the utterly besotted camp. In brief, I think she is the best thing to happen to conservatives since Ronald Reagan. I would feel far safer with her in the White House than I would were Joe Biden or Barack Obama presiding over the canapés at 1600 Pennsylvania Avenue. Why? Well, I enumerated some reasons in a couple of posts last month (here and here.) As it happens, these pieces took off from Bill Buckley’s famous mot about preferring to be governed by the first 2000 names in the Boston telephone directory rather than the 2000 members of the Harvard faculty. Why would he have said that? No Palin roundup would be complete without a mention of her shoes. The news services have a shoe fetish with Sara Palin’s shoes, and Mary‘s keeping track. I have been making a modest profit from posting Amazon associates links to Palin’s shoes. 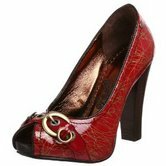 Like Palin, I favor red shoes, and bought myself a pair of these for my birthday last month. By the way, any woman with legs like Palin’s would be crazy to hide them in pantsuits. Eat your heart out, Hillary. How about the Palin tote bag? We’ve got your tote bag right here. Governor Palin visited with Alvaro Uribe and Hanid Karzai yesterday. Classic, basic, perfect for the ocassion. Covering the Palin shoes story: Footwear Plus calls! I just had the pleasure of being interviewed by Footwear Plus for an article on Sarah Palin’s shoes. Isn’t that great? 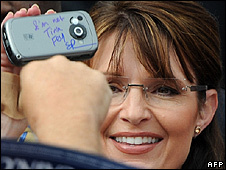 In other Palin stories, Neo watched the First interview with the unflappable First Dude, and she liked what she saw. So did I – he is a most attractive man. SARAH HAS SECRET STYLE TEAM, says the Post. And they’re doing an excellent job. She looks completely comfortable in her style. Will look for where to buy them – stay tuned!